A SUMMARIZED REPORT LISTING DATES OF PEREGRINE OBSERVATIONS AT PERSHORE AND PERSHORE ABBEY, WORCESTERSHIRE. Bird’s actual arrival time appears in bold. NOT KNOWN DUSK EAST SIDE This first sighting occurred during the week previous to the second observation. The bird’s first?? night was spent perched on a lead gutter spout. This has not been repeated to date. This sighting also coincided with the discovery of a half-eaten corpse of a Fieldfare Turdus pilaris, found on Abbey west side paving. 25 04 05 19.00 WEST SIDE Arrived on site from the east following alarm calls from Carrion Crows in nearby Park trees. Two white feral Pigeons were curious onlookers for a brief period. 29 04 05 07.05 Seen in flight west of Priest Lane, heading for Abbey Park and carrying prey. 14 05 05 15.30 Soaring to the southwest of Priest Lane, drifting back over Abbey Park. 27 06 05 21.25 NORTH SIDE A welcome return and switched roost position. Preening at 21.55. Ceased observing at 22.15. 29 06 05 19.50 NORTH SIDE Electric storm overhead. 30 06 05 19.20 NORTH SIDE Sat in full sun. 01 07 05 20.00 NORTH SIDE Watched bird arrive at the Abbey. EAST SIDE Gone by 17.00, but seen to return at 21.40 to the east side. 04 07 05 20.58 EAST SIDE Watched arrive. 06 07 05 19.30 NORTH SIDE Gone by 20.00. NORTH SIDE Interesting change of preferred roost position. NORTH SIDE In residence at least between 09.30 and 10.30, but gone before 11.00. 10 07 05 22.25 NORTH SIDE Abbey lighting reflected off breast feathers, facilitating view from our back garden. 12 07 05 22.00 EAST SIDE Illuminated by Abbey lights. 15 07 05 06.50 Flew in passing between trees and north side of Abbey. Not seen to stop off. 17 07 05 ? NORTH SIDE In for the night. 18 07 05 20.00 EAST SIDE Probably deafened by St. Andrew’s bell ringers. EAST SIDE Mobbed by Swifts Apus apus. Then a rare switch to a different side. When the Peregrine changed sides it became clear why the Swifts were upset. A Swift was being plucked for supper. 28 07 05 19.08 NORTH SIDE Ultimate armchair birding? Spotted the Peregrine coming in over rooftops from my leather recliner, heading for the Abbey. White breast illuminated by Abbey lights. 03 08 05 12.15 EAST SIDE Present at least until 13.15, preening. 08 08 05 20.30 EAST SIDE Sitting out a noisy bell ringing session. 13 08 05 20.30 EAST SIDE Preening. 15 08 05 17.35 EAST SIDE Gone when checked at 19.30. 17 08 05 07.05 EAST SIDE Not seen during the evening. 19 08 05 20.00 NORTH SIDE After an absence from my view for 61 hours, I was more than pleased to discover our falcon enjoying the setting sun and enduring the 20.00 hrs chimes, having once again changed roost position. 12.20 Viewed from garden with field ‘scope. 17.00 Sat through chimes. Wing stretching, turned around on narrow ledge so not facing into the sun. Had a substantial defecation. 17.25 More meticulous preening including underwings, upperwing coverts and scapulars. Then breast and belly feathers were fluffed out and preened. Next was the tail-section, facilitated by raising and twisting out the partly fanned tail. 17.35 Back to preening the breast. Then trousers of left leg tended to with a clenched foot held out in front. Defecated again by aiming out from the ledge in the interests of home hygiene of course. 17.58 Still preening after two hours. 18.40 Neighbour given a look through ‘scope. 18.55 Photograph taken from Abbey churchyard. 19.15 In for the night. 24 08 05 17.25 EAST SIDE Again a change in site occupation time and of preference regarding roost position on the Abbey. There does not appear to be much of a pattern to any behaviour regarding the use of the Abbey for roosting. This Peregrine obviously has an alternative site for preparation and consuming its meals, the roosting ledges it uses on the Abbey are much too restricted to plume large prey. An hour after observation time the bird had gone. I am currently working on the assumption of the bird being an adult male or tiercel, due to an extensively white breast and the lower barring being rather fine. Females can show rather coarse, heavy barring. 25 08 05 20.00 EAST SIDE After a day of showers and wind from the west, our bird took shelter on the east side. NORTH SIDE Enjoying full-on morning sun. Change of position for the night. 26th August 2005 was the 50th date the Peregrine had been seen in Pershore. This bird which has been our privilege to become acquainted with, brought with it a new personal experience of monitoring sometimes daily movements and behaviour of an over-summering Peregrine in Worcestershire. With the phenomenal success story of a remarkable population recovery since the banning of certain pesticides, Peregrines have adapted well to life in urban environments and increasingly roost and even breed on tall or large buildings in towns and cities. In my recording area of the North Cotswolds I have been accustomed to Peregrines being scarce winter visitors, though increasing in regularity even over-wintering in some areas. Trawling back through my local Peregrine records to 1996, I have no sightings for June, July or August. I often wonder how long this individual will remain single and whether or not when it finds a mate will they continue life together on Pershore Abbey as a breeding pair. During the last days of August darkness was suddenly apparent from 20.30 hrs. 01 09 05 20.30 WEST SIDE Yet another change of roost position after a few days absence from the Abbey. 02 09 05 20.15 NORTH SIDE Roost position changed again. 03 09 05 16.35 NORTH SIDE Today’s observation found the Peregrine on the north side, easily viewed from our back garden through the field ‘scope. 17.20 A left wing stretch and tail flexed to the side was followed by a preening session. 17.55 Peregrine took flight around the Abbey and off due north/northwest passing west of my position in Priest Lane. During the afternoon session of 3rd September, 2-3 dozen Starlings, Sturnus vulgaris, occupying the roof and pinnacles of the Abbey largely ignored the Peregrine. There was an occasional manic fly-past by a House Martin, Delichon urbica. Having watched the bird leave and paid a visit to the Abbey after dusk had fallen, I concluded the Peregrine had spent the night elsewhere. It was still not present the following morning. A short period elapsed before the next observations due to the observers being away. Not present during the morning. 21.00 Illuminated by Abbey lights and sitting through continuous peal of Abbey bells. A noisy neighbourhood was an endurance test for the roosting Peregrine. Excitable kids playing cricket in the park after England won the Ashes today. Noisy boy-racer cars passed by in the street and to top it all, Abbey bells. A fidgety falcon not surprisingly took to the wing at 19.50 hrs (dusk) for what may have been a pre-dark exercise flight to stretch the muscles after several hours on the ledge. As I walked our dog nearby, the falcon once circled the park passing over my head. 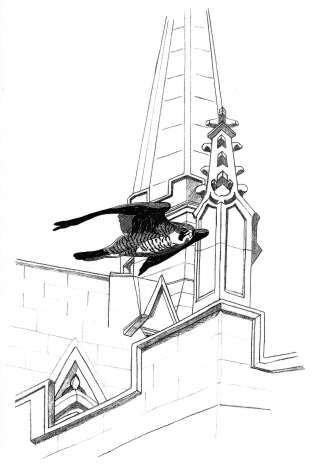 The bird re-alighted on the Abbey’s west side briefly before a change of mind and going back to the north side. Unbeknown to me, back home Christine had noted the time of the flight when checking the Abbey through binoculars. Pure genius as I had forgotten my watch. 13 09 05 19.50 NORTH SIDE My nature fix happened shortly before dark descended at the Abbey graveyard. The silhouetted shape of a small bat with a damaged right-wing fluttered weakly, but in a determined manor just above me. As I watched full of admiration for the poor creature, the contrasting image of power and grace glided directly over and into roost. 14 09 05 19.38 NORTH SIDE Routinely watching for the Peregrine’s arrival during the daily evening dog walk, I was rewarded after just a minute or two on site. Tonight the bird’s approach proved too high for the ledge and had to abort. A second attempt was successful. 17.55 NORTH SIDE Peregrine remained on the ledge since the previous night as morning rain had delayed its departure. As Christine and I sat in our conservatory the Peregrine appeared to the west in ascending flight from the Abbey heading off due north for the evening hunt. This meant the bird was absent from the Abbey during heavy evening rain. 16 09 05 19.35 NORTH SIDE Already in when seen. 17 09 05 P.M. NORTH SIDE In residence throughout the afternoon and into the night. 18 09 05 20.15 NORTH SIDE The bird was not in by 19.30 hrs (dusk), but a check after dark proved positive. 19 09 05 19.12 NORTH SIDE Already in when checked. Turned around on the narrow ledge and defecated outwards. First observation of the Peregrine back on the Abbey after five days absence. 18.30 Observed from our back garden through the field ‘scope. Bird very alert, constantly looking up and around. Defecated and preened breast feathers. 18.55 Re-checked through ‘scope only to find Peregrine had switched to the next ledge along. 19.15 Dusk and getting cold. Night, night. 25 09 05 20.00 NORTH SIDE Peregrine noted on ledge after dark. Sadly, the Peregrine has not been seen since this last date; only Starlings occupy the raptor’s favourite ledges now.